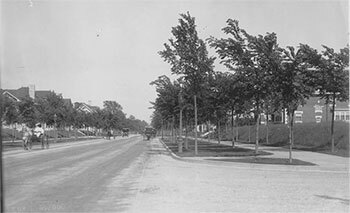 Armour Boulevard looking east from Campbell, 1905. Last week, Susan Hawks asked what we knew about the 3500 block of Campbell, and unfortunately, the answer is not very much. While the Kansas City Public Library has the 1940 photos of most blocks in Kansas City, this block is not available. So we’re hoping someone out there has information, memories or old photos of the block. 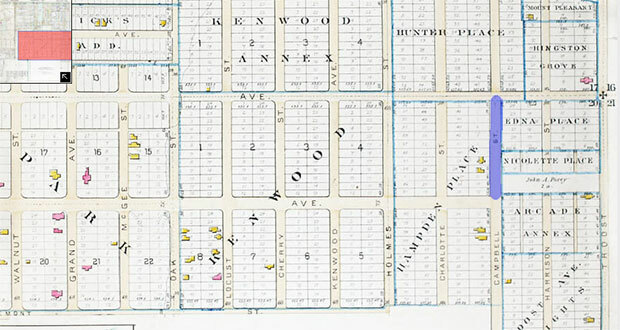 The map above is an 1891 plat map showing the block. 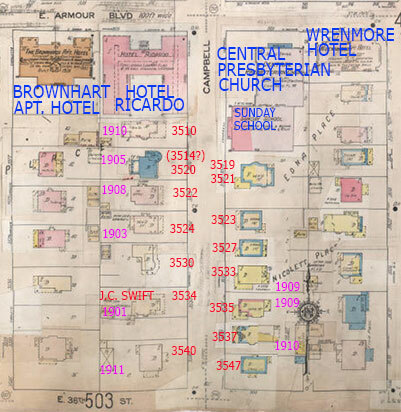 (Source: A Complete Set of Surveys and Plats of Properties of Kansas City, Mo. : Compiled and Drawn from the Official Records and Actual Surveys. Third Edition.) The shows the early Hyde Park and Kenwood subdivisions to the west. While the area has been platted in this map, only two houses had been built on the block. The oldest house on the block, 3534 Campbell, was owned by J>C. Swift in 1910. Swift was a prominent attorney and the president of the Livestock Exchange. Susan says she’s been looking for more information for a long time. If you have any to share, we want to hear about it. I would like to learn more about Hanover Place. The photo is mismarked. It is not Armour Blvd. looking east from Campbell, but Armour Blvd. looking east from Holmes. The side of the house you see is 721 E Armour Blvd. built by William Repp of Duff and Repp furniture in 1904-1905. We owned that house for 32 years. R. Perron, thank you so much for this information.